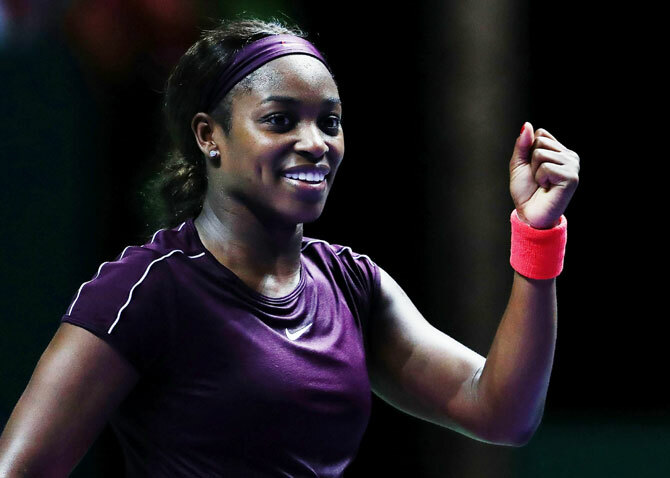 Sloane Stephens and Kiki Bertens continued their dream debuts at the WTA Finals when the tournament rookies won their final Red Group matches to advance to the last four of the season-ending event in Singapore on Friday. American Stephens stayed calm and saw off an increasingly agitated Angelique Kerber in the winner-takes-all night match to complete round-robin play with a spotless 3-0 record after she wrapped up a 6-3, 6-3 victory against the German. Kerber enjoyed a brilliant season with her third Grand Slam title at Wimbledon in July but the World No 2 seems to struggle in Singapore and was once again undone by Stephens, who now boasts a 5-1 head-to-head record against the German. "I stayed solid the whole time. I knew it was going to be a battle against one of the toughest players on the tour, so I just came out and played as hard as I could and am really pleased with the win," Stephens said in a post-match interview. Stephens staved off seven break points early in the first set and added to the German's frustration by converting the first two she fashioned to pull clear for a 5-2 lead after little could separate the baseliners in the opening exchanges. The games were getting longer as the intensity levels increased and the pair traded breaks early in the second set until Kerber's form dipped when she was broken in the eighth game and the American gleefully raced away to seal victory. 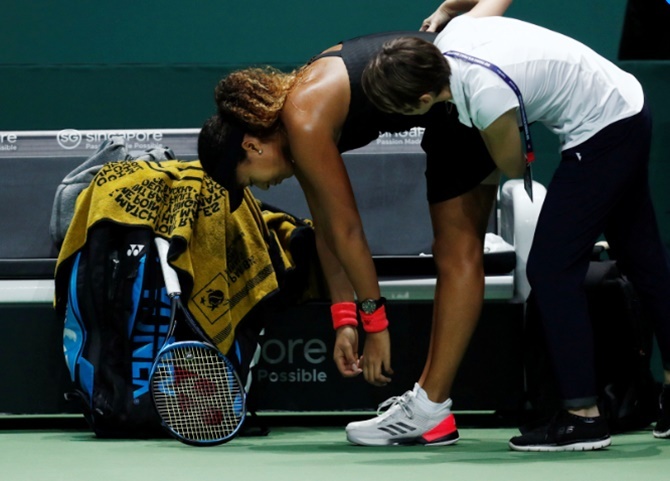 In the early match, US Open champion Osaka took to the court with tape on her left leg for a problem that flared up in her loss to Stephens on Monday, and was competitive for half a set before opting to withdraw after Bertens took the opener 6-3. Bertens, meanwhile, continues to thrive after showing marked improvement on all courts as opposed to her favourite clay surface, backing up her opening win over Kerber and three-set loss to Stephens with another solid display in Singapore. The late match has become a shootout for the final semi-final berth with Kerber (1-1) needing to win to finish second behind Bertens, while a Stephens (2-0) victory would mean the American tops the group ahead of the Dutchwoman. Elina Svitolina advanced to the semi-finals as White Group winner on Thursday, the Ukrainian joined by big-hitting Czech Karolina Pliskova in the last four. Saturday's semi-finals will see Bertens take on White Group winner Elina Svitolina of Ukraine, before Stephens faces big-hitting Czech Karolina Pliskova in the night match of a tournament that has seen the four lowest-ranked players advance. AB de Villiers: He's excited, we are excited and you should be too!